SAVEDx made its debut at the Massachusetts Museum of Contemporary Art in early 2019. 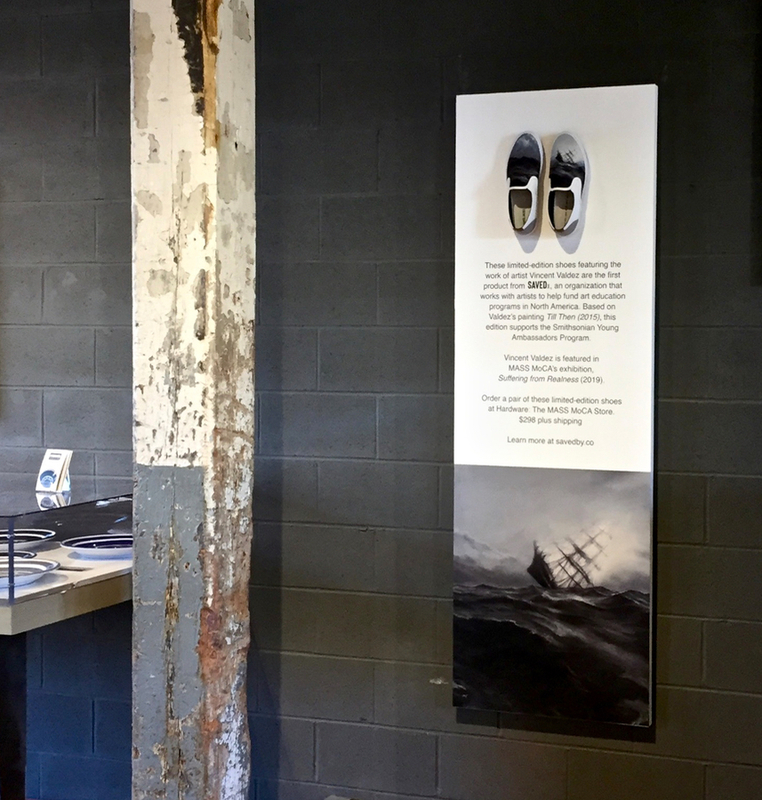 The custom installation for our SAVEDx VALDEZ series from artist Vincent Valdez is featured at HARDWARE: The MASS MoCA Store in conjunction with Valdez’s inclusion to Suffering from Realness [curated by Denise Markonish]. 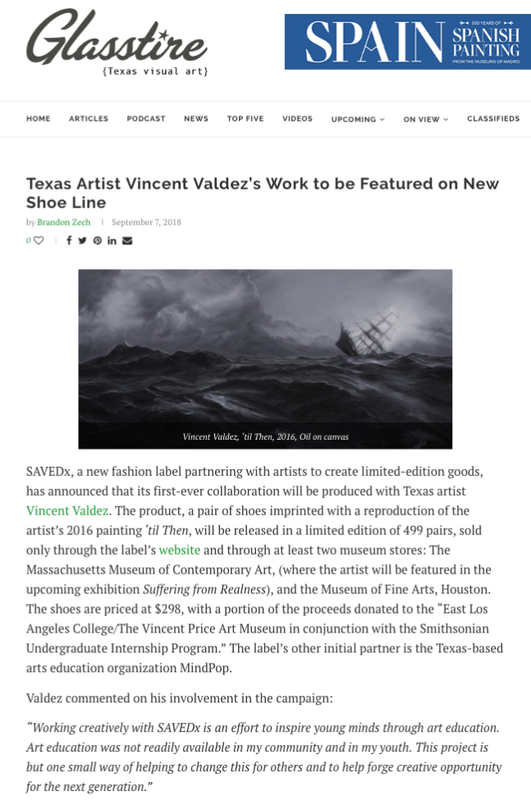 Based on the Valdez painting, Till Then (canvas/oil, 2015), the limited-edition shoes can be purchased via MASS MoCA and select museums for the remainder of 2019. A portion of proceeds will help fund the Smithsonian Undergraduate Internship Program. An engaging conversation at The Blanton Museum of Art between NPR's Maria Hinojosa and SAVEDx Partner Artist Vincent Valdez concluded with a gift of our first edition, Till Then. Per Maria, "It was a light moment in an otherwise very serious conversation about artists, art, social justice, hyper-realism, racism, changing the narrative, owning your voice & spirit of an artist who never gives up." Susan Stamberg of NPR will interview Vincent at the McNay Museum in San Antonio, Texas on Friday, June 1, 2018. The host of NPR’s "All Things Considered," Susan Stamberg has conducted thousands of interviews with world leaders, writers, and world-renowned artists. For this conversation, Stamberg turns her attention to Vincent Valdez and his paintings including The Strangest Fruit (#9). In the conversation, Stamberg and Valdez will discuss the latter's evolution as an artist and his recent work that examines and responds to contemporary life in America. Tickets for Considering Art: A Conversation with Susan Stamberg & Vincent Valdez are $30 for McNay and TPR members and $40 for non-members. Ticket includes a cocktail reception after the program. Doors open at 6:00 p.m., Program starts at 6:30 p.m.
©2019 SAVEDx. ALL RIGHTS RESERVED.